I was so stoked when I got this to work! The tools you need to get this working are a XModem application for the Tandy. I found one located on the Club 100 site here. You also need on the Handera an application called CFX located here. Note that CFX will only work on a TRGPro/Handera device. First you need a serial hotsync cable for the Handera. You could also use your hotsync cradle. With CFX on the Handera, set the baud rate to something low, for example 2400. Go into the XModem app on the Tandy & press F3 for STAT & key in 68N1E (for 2400 baud). In the XModem app, go into TERM mode on the Tandy (F7), then into XMod mode (F7 again). Press Return on the Tandy & you should now see the CFX:/ prompt that tells you that you now have access to the CF card on the Handera. 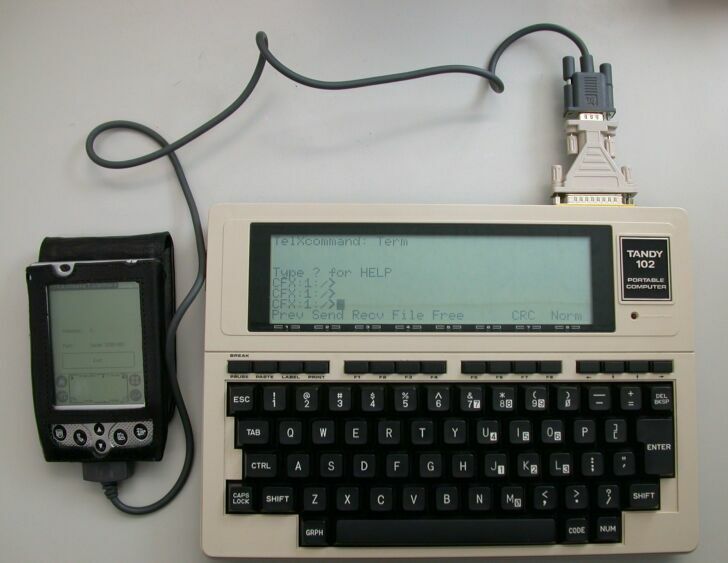 To transfer a ASCII file from the Tandy to the CF card, at the CFX prompt type "rx [name_of_file]". This sets up CFX to receive a file via the XModem protocol. Then on the Tandy choose "Send" in the XModem app, choosing the file you wish to send on the Tandy. All very easy! To send a file from the CF card to the Tandy you do the reverse to point 6.